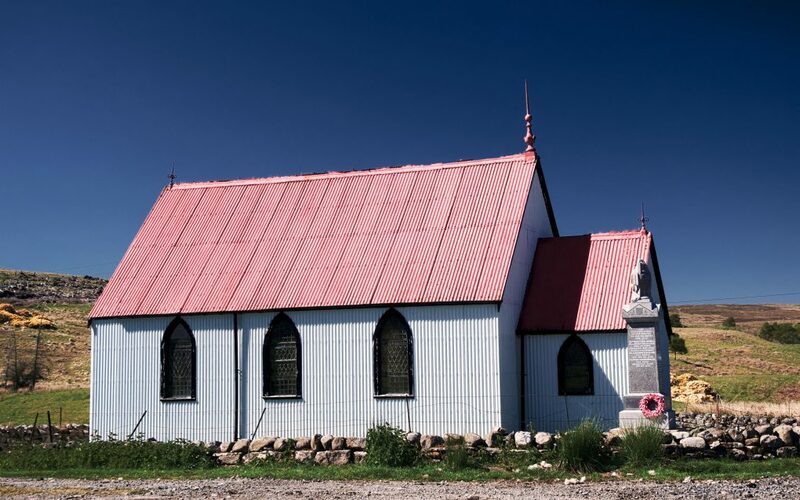 Despite its dimunitive scale, this church bulding by the roadside in Strathnaver for its corrugated iron construction and high-contrast decoration in bright red roof, white walls and black window frames and other outlines. 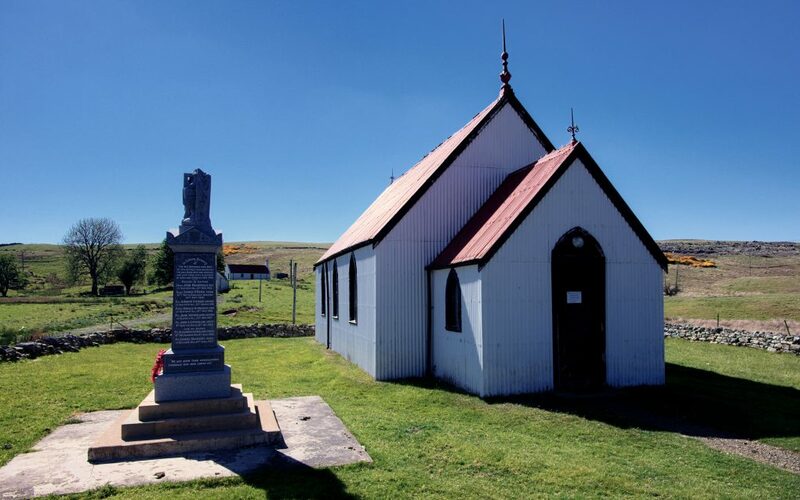 It was built in 1891 by the Free Church of Scotland as a mission church to serve the Sutherland estates. In 1900 it became United Free before joining Church of Scotland in 1929. 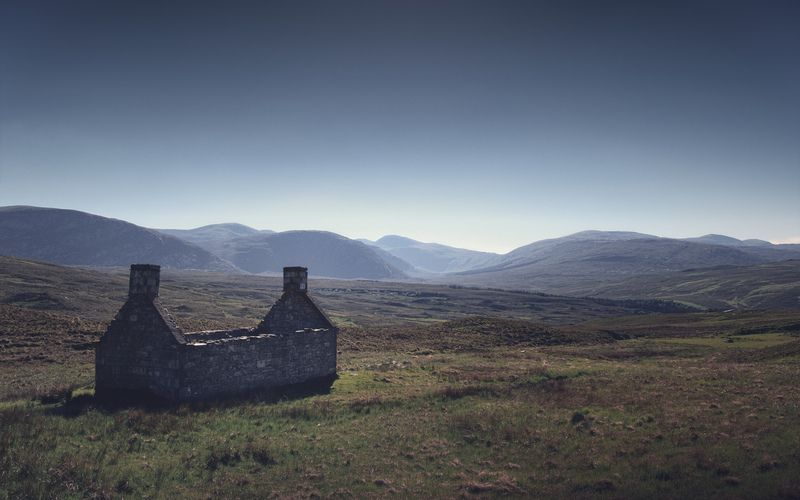 Further along, I discovered a beautiful but thought-provoking view: at Allnabad, a former shepherd’s house, now ruined and roofless, looks out over a barren landscape over the length of Strath Coir an Easaidh to beautiful undulating mountains beyond. Unusually for me, I made quite significant changes to the scene – the real lighting was strongly blue-green (a very Fuji summer landscape colour palette) but it works better with hints of relative colour beneath a pale sepia wash for a classic old-time look. (I’ve also slightly moved the small pile of stones relative to the building.) 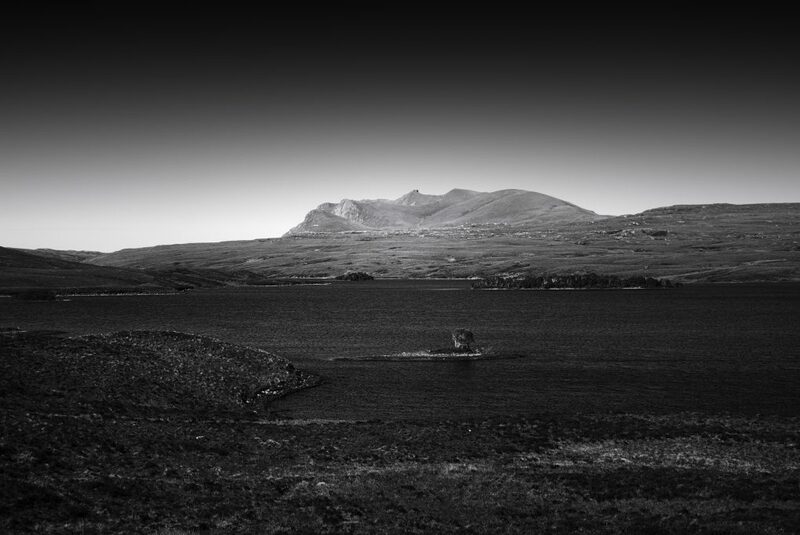 The resultant photo is called “The Story”, partly as a homage to the Runrig song of the same name, partly because of the sense of time – evolution of the land on geological and sociological timescales. Taken beside the Strathmore/Hope Road north of Altnaharra: a scene full of time from distant mountains to history of the foreground disused shepherd's house surrounded by former grazing terraces. The site of a shepherd's house, now abandoned, was also a substantial area of terraced grazing. Continuing north up Strathmore, I found the remains of the broch at Dun Dornaigil – conveniently built beside the road 😉 – on a lovely sunny day, just had to fly the drone up where a location a bit downstream made an excellent composition of river leading to the broch and Ben Hope in the distance. It was a beautiful afternoon - clear blue skies, sunny day - exploring Strathmore, so I just had to stop at Dun Dornaigil where the drone provided an excellent vantage point from which to view the remains of an impressive stone broch. 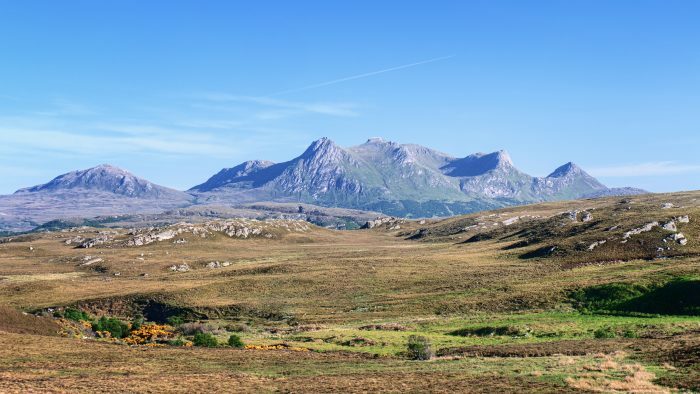 From there we drove up to the far north coast and followed the A836 east, keeping an eye on the landscape to the south. 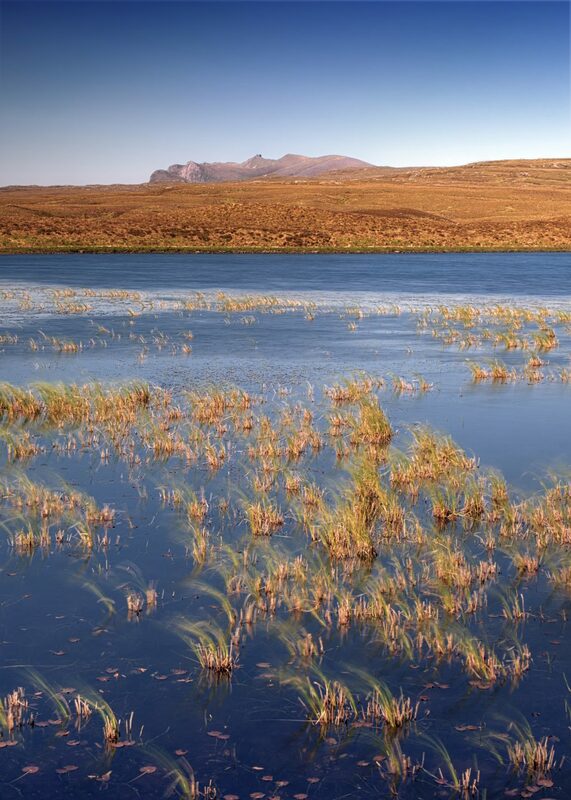 Ben Loyal makes an unmistakable outline with its four peaks; somewhere nearer to Tongue there was a convenient layby giving a comparatively clear view across to the mountain. An unmistakable mountain - the four horned outline of Ben Loyal from beside the A838. The weather was particularly pleasant for this shot - late afternoon light turning gold, clear blue skies with a hint of haze in the distance. Right time and place: driving just far enough I found a comparatively unobstructed view of the mountain with interesting undulating rocky foreground. 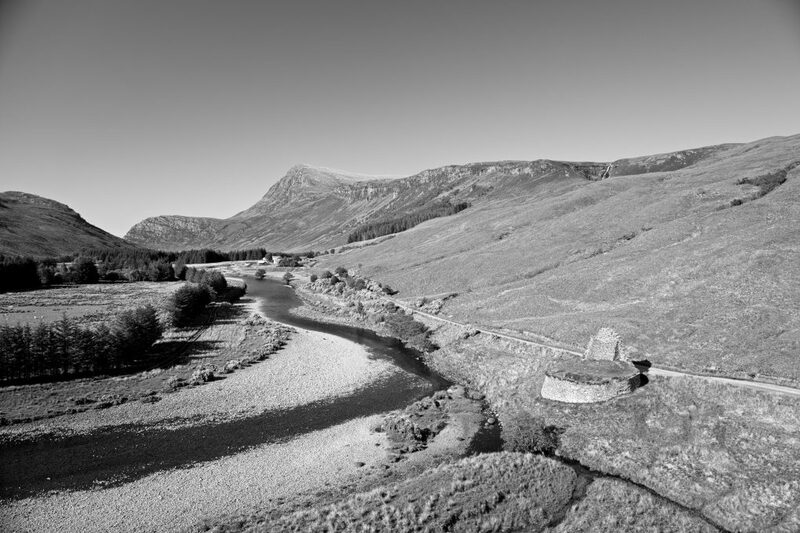 This entry was posted in art, daily, Highlands, photos, Scotland and tagged Church of Scotland, Fuji X-T20, hdr, holiday, land use, landscape, photos, story, Strathmore, Strathnaver, Sutherland.